Whether you're preparing a sermon, doing complex morphological analysis, or writing a seminary paper, scholars agree that BibleWorks is indispensable. You'll find everything you need for close exegesis of the original text in its 200+ Bible translations in 40 languages, 50+ original language texts and morphology databases, dozens of lexical-grammatical references, plus a wealth of practical reference works! Instead of providing a loose collection of books, BibleWorks tightly integrates its databases with the most powerful morphology and analysis tools. Read through the Bible... in less than a second. From complex morphological searches through the original text, to simple word and phrase searches through your favorite translations, the BibleWorks search engine zips through the databases and shows you the results. Send eight grad students to their cubicles to find every occurrence of the Granville Sharp construction and you'll have to wait a week before the results are in. Ask BibleWorks to do it for you and have the results in less than a minute. 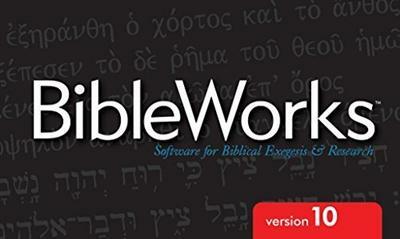 No program does complex queries faster than BibleWorks; it's the fastest tool on the market. BibleWorks comes with a wealth of Greek New Testament texts, LXX texts, and the Hebrew Old Testament text. In addition to the texts, most of the Greek New Testaments, the LXX, and the Hebrew OT also have their own morphology versions, where every word is parsed and lemmatized. Almost all major English versions are included in BibleWorks: KJV, NIV, NKJV, ESV, NASB, NLT, ASV 1901, RSV, NRSV, NJB, NAB, NET, CSB, etc. All of these Bible versions are unlocked. BibleWorks also has major Bible versions for nearly 40 modern languages, in addition to Greek, Hebrew, and Latin. Detailed study of the original texts is now possible for those who know English, Spanish, German, Italian, French, Chinese, Japanese, Arabic, Portuguese, Russian, Polish, Dutch, Indonesian, Swedish, Czech, etc. In addition, you can add your own Bible versions to BibleWorks. BibleWorks comes with lexicons and dictionaries for Greek (Louw-Nida, Thayer, Friberg, Liddell-Scott, etc. ), and Hebrew lexicons (Holladay, unabridged BDB-Gesenius 1905, condensed Pierce-Strong's BDB-Gesenius, Whitaker's abridged BDB, etc. ), all unlocked. In addition to these, you can also purchase the separate BDAG and HALOT modules! It's important to keep your language skills sharp, so BibleWorks also includes several Greek and Hebrew grammars (Burton, Conybeare, Davis, Jo? ?on-Muraoka, Verbruggen, Wallace, Waltke & O'Connor, etc.). As you move the mouse over the text, you can quickly jump to all relevant sections in the BibleWorks collection of grammatical and lexical references. In addition, BibleWorks comes with two complete sets of Greek NT sentence diagrams (Leedy, MacDonald), Greek and Hebrew flashcards (with audio), paradigm charts, and more! Grammatical and morphological searches are a breeze! When you're done searching, BibleWorks gives you detailed statistics and lets you transfer texts, verses, parallel passages from different versions, entire Bibles, and lexicon entries to your favorite word processor. When you need a break, BibleWorks lets you store your lists of verses for another day. Overcome the barrier between you and the original language texts. With the BibleWorks Word Analysis feature, seeing and parsing the underlying Greek or Hebrew words is as simple as waving the mouse pointer. As the mouse moves over any word in a BibleWorks tagged text, the Greek or Hebrew lexicon definition for the original text is shown along with the parsing. When the mouse hovers over a word in a tagged text, a Popup Gloss window gives you a brief definition and morphology for the word. In addition to these helps, the Resource Summary Window automatically lists all relevant entries from the various lexicons and resources for the verse and word under the mouse. As you move over the text, the window automatically shows the opening line for all relevant entries. The following Bible versions are tagged: the Greek NT, the LXX, the Hebrew OT, the KJV, and the NAS, as well as some of the other English, German, French, Dutch, and Russian versions. Additional texts such as Josephus, Philo, and the Apostolic Fathers are tagged also. If you like working with parallel columns, simply click on the translations you want to see. The Parallel Versions window puts the Bibles in parallel columns where you can scroll the columns in sync, or independently. BibleWorks lets you save all of your favorite parallel versions configurations in a convenient menu so that you can easily pull up your "NKJV-Greek NT-NRSV" or "NAS-Lutherbibel-BHS Hebrew-LXX" parallel window with just a click of the mouse. You get Word Analysis here, too, as well as tight links to the lexicons and dictionaries. In the Browse Window, the Bible versions you are studying are shown in a single window with the passage from each text. This is the basic work-horse window of BibleWorks. Get rid of all those lexicons, dictionaries, concordances, and scribbled notes that clutter up your desk when you're buried deep in textual study. In all of these ShiChuang, you can click, or just point to any word and get the information you need (concordance, lexicon, word frequencies, cross-references, etc.). You can also attach notes (with Greek and Hebrew!) to verses and have them automatically display when the verse is opened. BibleWorks works smoothly with other programs, making it simple to transfer texts to your favorite word processor. BibleWorks comes with TrueType and Unicode fonts for accented Greek and pointed Hebrew. The fonts can be used in ShiChuang word processors and print beautifully. With the built-in editor, you can also take notes in English, Greek, and right-to-left Hebrew. The samples below use the BibleWorks Greek and Hebrew fonts. BibleWorks accommodates users who spend significant amounts of time with the program. In response to the variety of user suggestions, window sizes, window placement, output format, abbreviations, and font sizes can all be customized. In addition, many requests for mouse and keyboard short-cuts have been put into the program. Fewer clicks save wrists! - Requires BibleWorks 9 or higher.